Review by AllTheBestFights.com: 2015-07-12, pretty good finish between Kamaru Usman and Hayder Hassan but it is not enough to get three stars (UFC Performance of the Night). Kamaru Usman entered this fight with a pro record of 5-1-0 (100% ko/tko victory rate) and he is ranked as the No.39 welterweight in the world while his opponent, Hayder Hassan, has a record of 6-1-0 (83% ko/tko victory rate); both fighters have never won via submission. 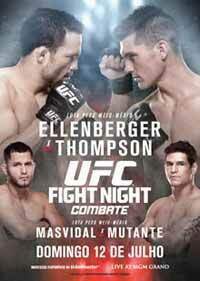 Usman vs Hassan is the welterweight final of The Ultimate Fighter 21; undercard of Jake Ellenberger vs Stephen Thompson – UFC TUF 21 Finale (American Top Team vs Blackzilians). Watch the video and rate this fight!